With the DI Accessories Featherweight Foam Cannon and a pressure washer, you will be able to apply a thick layer of shampoo to the surface quickly and easily! Just fill the reservoir with any shampoo, connect it to your pressure washer and spray a thick layer of soap onto the surface! Once applied, the foam will encapsulate contaminants, breaking them down and loosening them from the surface for a safe, scratch-free wash process. The DI Accessories Foam Cannon is extremely popular and the Featherweight Foam Cannon is very similar to this great unit, however there are a few differences. The Featherweight Foam Cannon is made from military grade aluminum, cutting down on the overall weight of the unit significantly. This lighter material allows this unit to work great with household pressure washers (under 3000PSI and 2.5GPM) and come at an overall lower price point. This makes the Featherweight Foam Cannon a great option for someone with a smaller pressure washer, value shoppers, or the weekend warrior who does not use the Foam Cannon as much as a professional would. The DI Accessories Featherweight Foam Cannon is an incredible tool that helps you get great results at a great value, so pick one up and see for yourself! Note: The Featherweight Foam Cannon, DI Accessories Foam Cannon and DI Accessories Foam Lance are designed to work with majority of pressure washers, including Karcher units. If you have a Karcher you may need to pick up the DI Accessories Karcher K Series Foam Lance Fitting for a seamless fit. If you do not have a Karcher pressure washer, the DI Accessories Speedy Super Foamer is also a great choice! 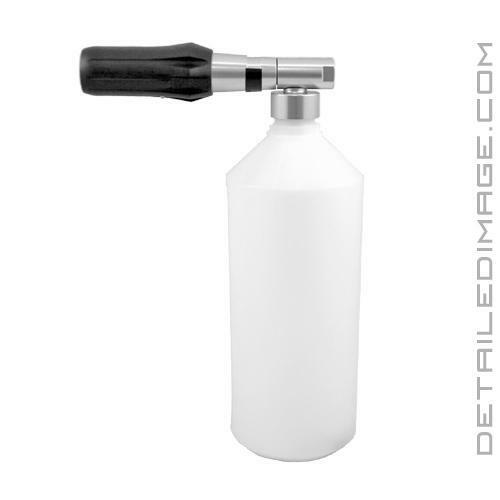 If you are you looking to spray foam vertically AND horizontally with one unit, the DI Accessories Foam Cannon is an great option!